Come and enjoy Israel & the Feast of Tabernacles 2019 ! Nazareth, Cana, Mount Tabor, Tiberias, Sea of Galilee, Capernaum, Tabgha, Mt. Beatitudes, Baptismal Site at Jordan River, Caesaria Phillipi, Mount Carmel, Megiddo, Caesaria, Jaffa, Ein Karem, Bethlehem, Jericho, Mount of Temptation, Dead Sea, Qumran, Massada, Ein Gedi, Jerusalem, City of David, Siloam Tunnel, Temple Mount, Pools of Bethesda, Via Dolorosa, Ecce Homo Arch, Churh of Holy Sepulchre, Room of Last Supper, Garden Tomb, Gathsemane, Western Wall, Old City Walls, Israel Museum & Dead Sea Scrolls, Yad Vashem. Travel insurance for participants younger than 70 years old. Depart tonight from ORT Johannesburg on a flight to Israel. Arrive early in Tel Aviv. We first stop for refreshment (coffee & pastry). Spend time on Mt. Carmel, the scene of the most dramatic events of the Tanakh (Gen-Mal). Here is the site of the contest between God and Baal. At the bottom of this hill is the Kishon brook where Elijah had the 450 prophets of Baal executed. (1 Kings 18). Drive past Megiddo (we don’t go in), a place of fortifications and battle from the time of ancient Egypt up to and including WW1. We ascend Mt. Tabor, the traditional site of the transfiguration and the certain site of the victory of Israel under the Judge Deborah. Visit Mt. Beatitudes– one of the most beautiful and serene sites in Israel. 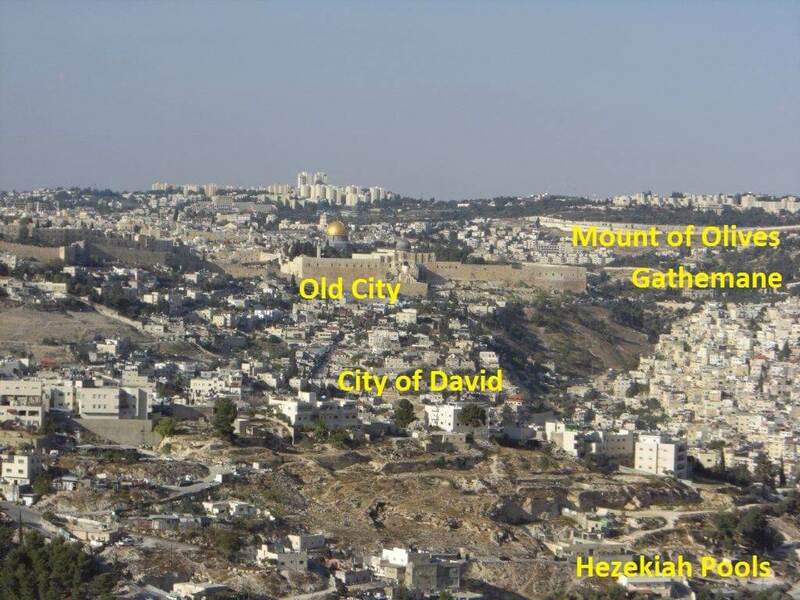 In this area Y’shua gave the Beatitudes (Sermon on the Mount), taught on many occasions and also performed many miracles. 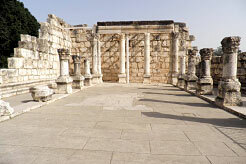 Visit Capernaum, an important prosperous town in the 1st century, located on the main road from Damascus to the coast. As such, it was a tax collection point for the Romans, and home to one of their appointed tax collectors, Matthew. From its community of fisherman He chose Peter, Andrew, James and John as His disciples. The Gospel tells about Y’shua leaving Nazareth to settle in Capernaum, which became “His home town” and centre of his activities. We then walk to Tabgha, where Jesus performed the miracle of the multiplication of the fish and loaves and fed 5000. Inside the church is the famous mosaic. Continue to Gennosar Museum to see an ancient boat from the times of Y’shua found under the water. Cross the Sea of Galilee by boat and worship on our way to Ein Gev. Feast on a traditional St. Peter’s fish-lunch. Visit Cana, site of Yahshu’s (Jesus’) first miracle- turning water into wine. Continue to Nazareth where Y’shua spent his childhood. Visit Nazareth. We the Church of Annunciation and the Synagogue where Y’shua celebrated His Bar Mitzva. Quick stop at a ‘Sweets Shop’ and taste Nazareth’s famous ‘nougat’. If time permitting, drive up Mt. Precipice- spectacular view over the fertile Izrael Valley. Drive to Yardenit Baptismal Site at the Jordan River for a baptismal service. 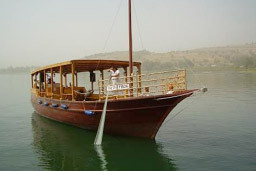 Tonight after dinner, enjoy Boat-Ride on Sea of Galilee with music, worship, soaking and minister unto the Lord!! Visit Jericho, known as the oldest city in the world Joshua conquered. 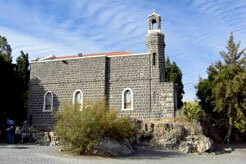 Drive to Qsar-al-Yahud to view the site according to tradition where Jesus was baptized by John the Baptist. Travel to Massada and ascend by cable car. Our guide will take us on a fascinating tour of this mountain where 960 Jewish defenders organized the last resistance to the Roman conquerors. 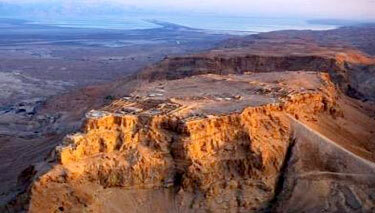 Visit Ahava’s Dead Sea cosmetics factory and continue to Qumran where the Dead Sea scrolls where found. 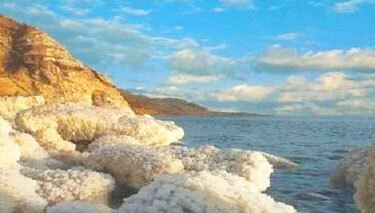 Swim in the Dead Sea or use the luxurious facilities at the hotel. We attend the spectacular Sukkot Opening Celebration of the IECJ at Ein Gedi. Ascend the hills of Judea and enter Jerusalem the “Eternal City of GOD”! Travel to Bethlehem*; visit Church of Nativity where Y’shua was born and Shepherd’s Fields. Drive up to the crest of Mount of Olives. 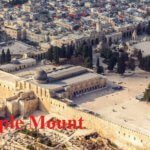 For every Jew traveling to Jerusalem up from Jericho along the Jordan Valley, the view from the Mt of Olives was their 1st sight of Jerusalem- as it is even today. From here the entire city of Jerusalem unfolds before us; view of the Temple Mount, across the Kidron Valley to the Eastern Gate. Visit Pater Noster and Ascension Chapel. 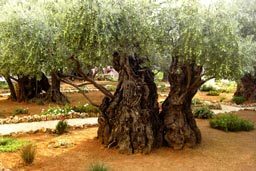 Walk down along Palm Sunday road; see Dominus Flevit (“The Lord wept”) and proceed to Garden of Gethsemane to be among the ancient olive trees, read the Scriptures of Yahshua’s prayer and take time for personal reflection. Our 1st night in Jerusalem: our hotel is close to Ben Yahuda Street where you can find restaurants, sidewalk cafes, shops, street vendors and street performances. A festive atmosphere of Sukkot-celebrations in Jerusalem. 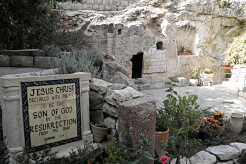 Visit the Garden Tomb where we will hold a Communion Service. Today we tour the Old City. 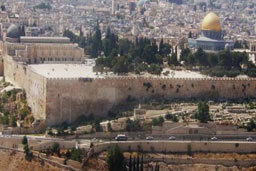 Visit the Western Wall. Continue to Pools of Bethesda, located north of the temple mount. The pools were probably designed at times Herod the Great for the Jewish inhabitants to purify themselves and here Jesus performed the miracle of healing an infirm man. We next visit Lithostrotos and St. Anna Church. Take a short walk along Via Dolorosa (‘The Way of Suffering’) which marks the traditional way that Yahshua took from His judgement by Pilate to the site of His crucifixion, all the way to Holy Sepulcher. Go up Mount Zion where to visit the Room of Last Supper where Jesus shared Last Supper with the disciples. Next visit is to St Peter Gallicantu where the house of Caiaphas was where Peter denied Jesus. Then visit the Tomb of David. At night take the light train to Ben Yahuda Street- here we find restaurants, many side walk cafes, shops, street vendors and street performances….. and a festive atmosphere of Sukkot-celebrations!! Visit Israel Museum to view the Dead Sea scrolls and Jerusalem Model. Continue to Yad Vashem memorial for the Jews died in the Holocaust. 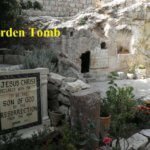 Travel to Ein Karem to visit John the Baptist cave and a church where the Ark was kept. Continue to l to Nabi Samuel Grave (the highest site in Jerusalem 900 meters and Crusades Citadel. Visit The Benedictine monastery in Abu Ghosh, named St Mary of the Resurrection Abbey. It is centered on the Church of the Resurrection, built by the Crusaders in the 12th century on top of Roman ruins in the center of the village. Free day to own activities. No bus & guide today. Take the light train to Jerusalem Old City or Machane Yehuda market for shopping …or other places your guide will recommend. Optional: Join the Jerusalem march in the afternoon and attend ICEJ-Evening Celebration at Pais Arena. 3 nights extension in Jerusalem if you wish to continue participating in the Feast of Tabernacle Celebrations flying back to South Africa October 21 night.